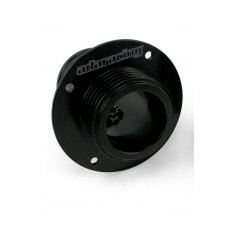 kawasaki fuel hull fitting black (BLACK ONLY). Billet aluminum fuel cap socket for the Kawasaki Jet Skis. Works with the stock plastic or aftermarket billet gas caps. Includes attached chain. Replaces the plastic Kawasaki OE part# 59231-3716. Fits the 800SXR, 12F, 15F, 1200STX-R, 1100ZXi, and the 900STX. May also fit other Kawasaki models.